Ships dock in the main port of Thessaloniki, an easy walking distance from the downtown area. Simply exit the cruise terminal and walk along the waterfront to your right. Thessaloniki is the capital of Macedonia, the second largest city in Greece, and has a history that dates back to the fourth century BC. Regarded by many to be Greece's hippest city, the influence of the east is pronounced, both in the delicious food and the relaxed lifestyle. History-minded visitors will visit the many museums with their great displays of artefacts from, for example, Sindos and Vergina. There are also many notable Byzantine monuments, a UNESCO World Heritage Site, and several Ottoman and Sephardic Jewish structures. Also of interest are the ruins of Vergina that includes, among many famous tombs, the tomb of King Philip II, Alexander the Great's father. There are other places of interest within the city which include the palace of Galerius, the ruins of the Roman Market and Theatre, Nymphaion, a fascinating and elegant circular building, and the Roman Baths. Hire a car or take a taxi and visit the beautiful beaches and countryside, or simply take a delightful stroll along the waterfront. Enjoy the food at the delightful restaurants, and don't forget that Thessaloniki is famous for its high fashion industry, so is a great place for women to enjoy shopping. The pride of Thessaloniki is the archeological museum. Located a few blocks inland from the White Tower, it features a fabulous collection of gold jewelry and artifacts dating back to centuries B.C.. While the structure itself is underwhelming, the museum is well worth exploring. The main sightseeing attraction for the port of Thessaloniki is Ancient Pella and your ship will undoubtedly offer a shore excursion to this ancient city that became the capital of Macedonia in the fourth century B.C..
Thessaloniki is a shopper's paradise. The City center is small yet blessed with an abundance of shops, markets, bars and coffee houses to suit all budgets and tastes. 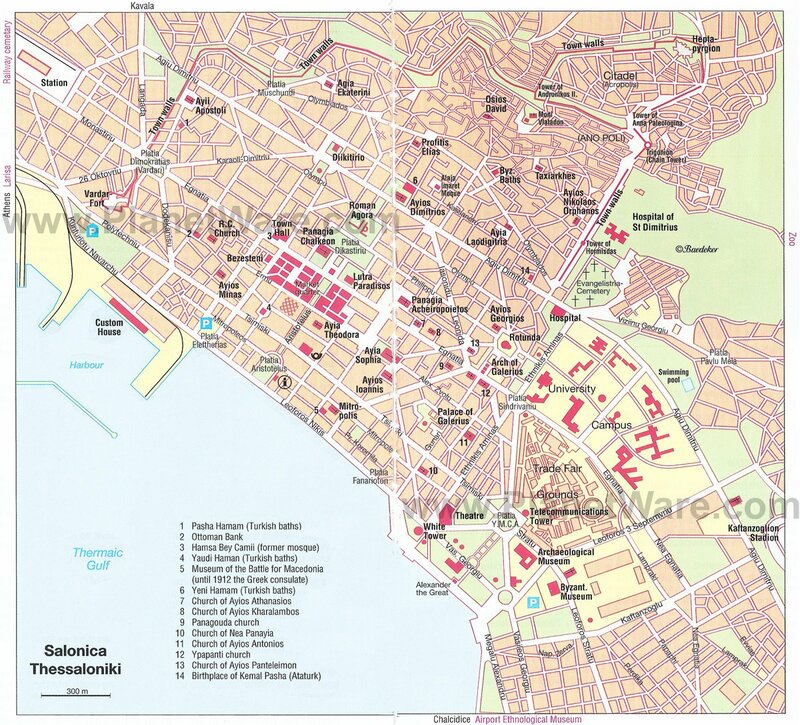 Virtually every side street veers off to locate some Greek delicacy from pastries to artwork. Similar to the layout of the 'Bar Streets' across the Greek Islands, shops are to be found in a familiar fashion. Stores stocked to the brim with the latest Italian leather shoes are situated in succession. Meander around a corner and street stalls and shop windows will beckon you to co-ordinate a new bag.